Not sure how this depicts The Wheel of Fortune? Click here. Etteilla: Fortune, Happiness, Prosperity, Destiny, Abundance, Growth. 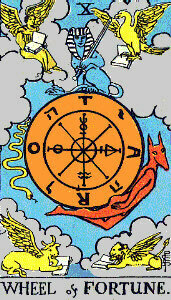 Lévi: This hieroglyph depicts the cosmogonical wheel of Ezekiel, with a Hermanubis ascending on the right, a Typhon descending on the left, and a sphinx in equilibrium above, holding a sword between his lions claws. 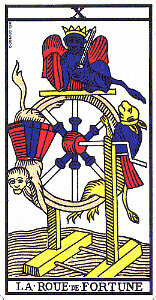 Illustration (left): The Wheel of Fortune from Ancien Tarot de Marseille by Paul Marteau (1930) (copyright &COPY; 1980 Grimaud). Click the image for a larger one. Christian: The Sphinx, balanced on the top of this wheel, holds a sword in its lions paws. It personifies Destiny ever ready to strike left or right; according to the direction in which it turns the wheel the humblest rises and the highest is cast down. Papus: Two ideas are expressed by this symbol: (1) the idea of Command, of Supremacy, and (2) the idea of duration, of the eternal action of time. Felkin: The Wheel is the revolution of experience and progress, the steps of the Zodiac, the revolving staircase, held in place by the counterchanging influence of Light and Darkness, Time and Eternity. Waite: The symbolic picture stands for the perpetual motion of a fluidic universe and for the flux of human life. The Sphinx is the equilibrium therein. Behind this general notion there lies the denial of chance and the fatality which is implied therein. 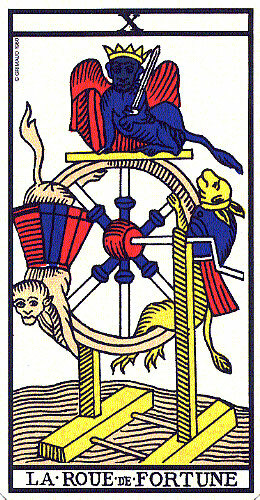 IIllustration (left): The Wheel of Fortune from The Rider Tarot Deck designed by A. E. Waite, drawn by Pamela Colman Smith (1909) (copyright &COPY; 1971 U.S. Games Systems). Click the image for a larger one. Wirth: A starting handle sets this fateful wheel in motion, rapid at first, but slowing down till its stop marks death. After the precipitation of the strong rhythm of youth comes the calm regularity of maturity then the decline into old age which ends in a fatal and complete standstill. Case: Occult teaching emphatically asserts that what seems to be chancewhether absence of purpose or absence of designis really the working of unalterable law. The rotation of circumstance appears to be accidental, but is not. 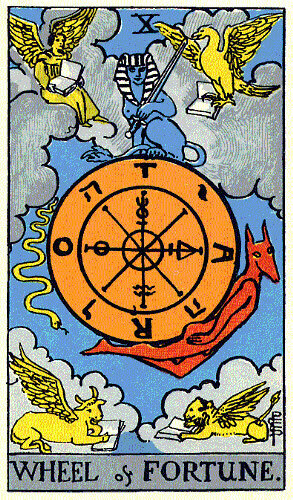 Crowley: This card represents the Universe in its aspect as a continual change of state. Sadhu: The Mill or Wheel of Transformations is enlightened by something Higher, something implacable which pulls and kneads us, in a painful process, in order to prepare a better dough for the future bread. Gray: Good fortune, success, increase, unexpected turn of luck. ONeill: The wheel symbolizes the oscillations of life: light/dark, happy sad, success/failure. These oscillations are reflected in nature in the change from day to night and from summer to winter. The cycle itself is the Archons trap, a wheel of torture, not of progress and motion. The motion is only apparent. Pollack: Fate is an illusion, a dodge to cover up the face that we, with out limited vision, cannot see the inner connections between all things. Oh well, we say, its fate, a meaningless statement because we cannot under the meaning. Things do not just happen, they are made to happen. Turk: You are bombarded every day by a profusion of sense-impressions which you cannot escape. Only by turning your back on the wealth of the world and its material offerings can you step off the ever-turning wheel. Symbol (top): It depicts a wheel between two uprights.